Juventus took control of this Champions League semi-final with an impressive 2-0 victory, thanks to two goals from Gonzalo Higuain. Leonardo Jardim’s side featured one surprise – Benjamin Mendy wasn’t fit to start at left-back, so Djibril Sidibe switched to that flank and Nabil Dirar played at right-back. Max Allegri left out right-winger Juan Cuadrado and played Andrea Barzagli instead, a significant move that would shape this game’s tactical battle. The use of Barzagli suggested some kind of grand plan. Pre-match speculation suggested this could be simply Allegri using Barzagli at right-back, and pushing Daniel Alves forward to shut down Mendy – but, of course, with Mendy out that approach wouldn’t have made much sense. The use of Barzagli also opened up the possibility of Juve playing a hybrid three-/four-man defence, as they’ve previously done so effectively. But this was more or less a simple three-man defence, with Alves pushed forward as a wing-back and Alex Sandro on the opposite flank. Sometimes it looked like a four when the wing-back on the near side closed down, and the one on the opposite side tucked in. But the flexibility wasn’t the key here, it was more the simple three-man defence and use of wing-backs that seemed to catch out Jardim and Monaco. 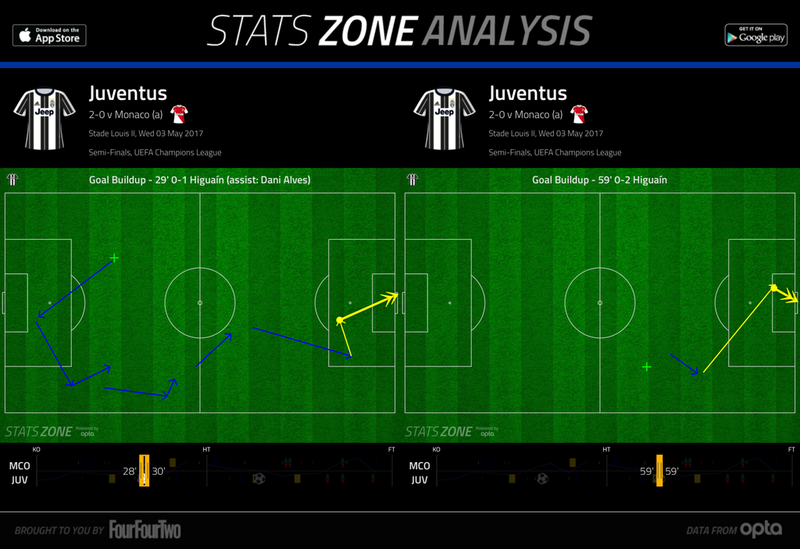 Juventus dominated the opening stages, and their formation played a big part. With Monaco using a very narrow 4-4-2 system with all the midfielders crowding the centre of the pitch, Juventus found it amazingly easy to keep possession and simply transfer the ball out to the flanks repeatedly. Alves and Alex Sandro were always in space for simple passes, or sometimes for more ambitious balls – Alves snuck in behind the opposition defence, as he’s done so often over the years, but his volleyed cross was too strong for Higuain. Monaco never really adjusted to this problem, and they particularly struggled down their left flank, where Sidibe looked very uncomfortable in a relatively unfamiliar left-back role, and often tucked inside into narrow positions to leave space for Alves. On the opposite flank Alex Sandro pushed forward less, in part because Mario Mandzukic was often in that zone. The Croatian moved inside into central positions too, and on a couple of occasions exchanged one-twos with Higuain, the two effectively becoming strike partners. The curious thing about Juve’s use of three centre-backs, however, was that it didn’t make them any more secure in defence. This is generally considered amongst their major strengths, but at 0-0 they allowed Kylian Mbappe two excellent chances – the first a header in the aftermath of a set-piece, the other a near-post volley from a right-wing cross. The first he should have done better with, the second was a good attempt that forced Gigi Buffon into a smart stop. It was strange to see Juventus, with three-against-two at the back, conceding chances from crosses – perhaps they were surprised that Mbappe, known primarily for his speed in behind, was also a threat in these situations (although overall Barzagli deserves great credit for his handling of Mbappe, a man nearly half his age, and with considerably more speed, on the ground) Radamel Falcao also had a header tipped around the post by Buffon, after another right-wing cross. 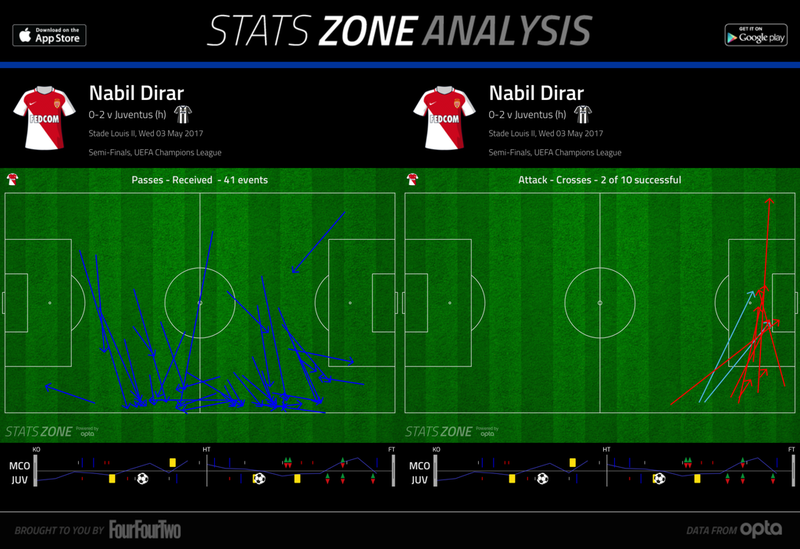 It was notable that Monaco’s best chances generally came from Dirar, which was a slight surprise considering Juve had both Alex Sandro and Mandzukic to stop him down that flank, although Bernardo Silva was drifting inside intelligently to create space. Dirar was a constant threat, and the fact Juve struggled with an overlapping full-back makes you wonder how they would have coped with Mendy on the opposite side. This game was basically about two men, however. Alves was outstanding down the right, always finding space on the outside of the Monaco defence and storming forward into attack regularly. The aforementioned overhit cross towards Higuain was a warning sign, because Juve’s goals both came from Alves assists and Higuain finishes. The first, after half an hour, came at the end of a brilliant free-flowing Juventus move that featured two backheels – one from Paulo Dybala in midfield, the other a brilliant (if admittedly hopeful rather than calculated) flick from Alves into the path of Higuain, who swept the ball into the far corner. The second, after an hour, was less spectacular but still very impressive, with Alves floating a deep cross over the Monaco defence, and Higuain converting at the far post with his left foot. Monaco simply never got to grips with Alves. At 0-2 you never entirely believed Juventus would relinquish their advantage, although Monaco created a couple of fine chances when Falcao slipped past Chiellini, and then when Kamil Glik headed over at a set-piece, and Buffon was busier than Allegri would have liked. This wasn’t quite the controlled, efficient away Juventus victory the scoreline might suggest. Indeed, it’s arguable that Monaco actually created better chances throughout this game. Yet somehow Juventus seemed dominant. 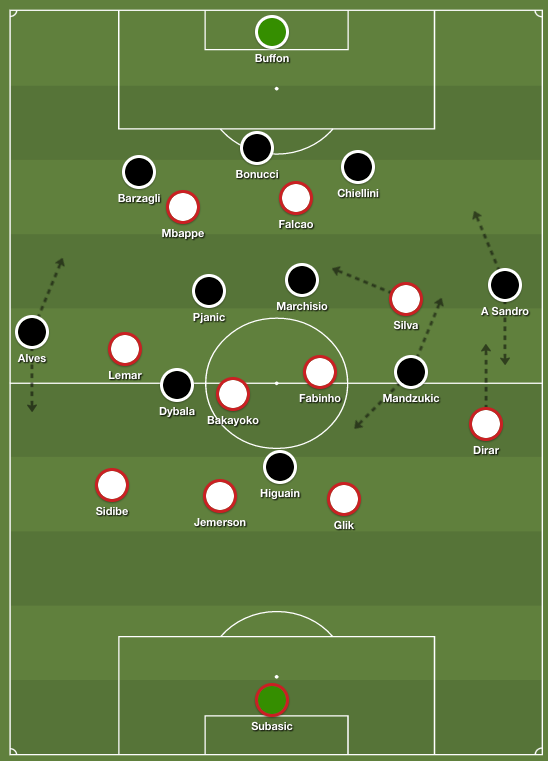 Allegri’s use of wing-backs proved crucial – they were always available for a simple out-ball in the opening stages, and Alves rampaging forward against Sibide, out of position and Monaco’s weak link on the night, proved crucial in the two goals. Why are the Italians so good tactically? In my opinion, its cultural. 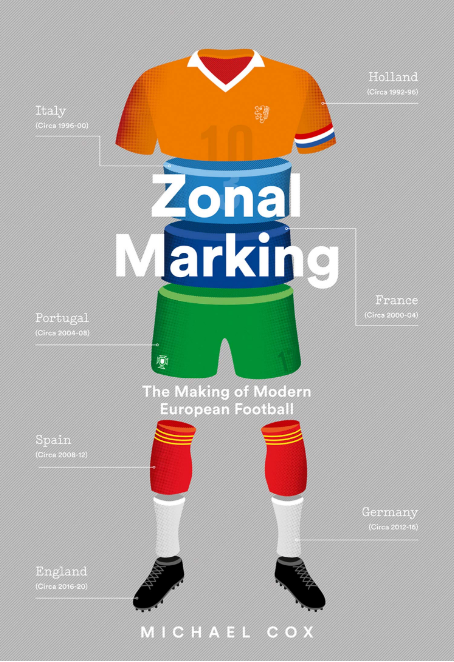 Most nations have a preference as to how they play the game with the ball. I believe Italians view the game more in how you play the game without the ball. 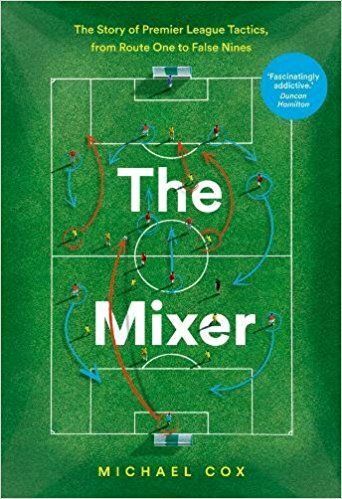 When your preference of play has to do with possession of the ball, your success comes from the skill of the players and the ability execute with the ball. How many times have we seen Italian teams over-achieve or a mediocre Italian players have “breakout” tournaments based on their role? Then you put that mindset to work with world-class players like Juventus have and you get juggernauts. I think it was a clear 4-4-2 in defensive phase from Juventus. In attack they switch to a 3-4-1-2 as Manduzkic darted forward to become a second striker, Alex Sandro overlapped and Barzagli stayed deep keeping 3 at the back at all time. Alves was the key here. With less defensive responsibilities being the right midfielder rather than the right back in defensive phase, he was able to play with more freedom and his combination play with Dybala evoked the relationship he established with Leo Messi in Barcelona. This Juventus side is tactically impressive and such a display wouldn’t be possible without the work rate of Mandzukic, probably the most important player for Allegri, as he plays 2 roles at the same time. I’ve been posting on this site for a long time now and I’m just so happy about the way Juve are playing, tactically, in Europe this year. Allegri has managed the transition from the Conte era so well and we are a better all round team now. We are million times better now without the ball. Why because we don’t just defend deep. We can also press high or in midfield. Even with the ball we are so much better on the counter. Exploiting space after winning the ball deep, in midfield or high. We don’t break down teams down like we used to with the ball. Conte’s attacking coaching with the ball was sensational but like Pep, he’s too much of a micro manager in this area. in Europe, everyone tries to play high so you get space, so the possession game from deep is not only the wrong approach, it also dragged too many players forward and then when we lost the ball we were exposed 1 v 1 Galatasaray and Bayern in 12-13 and 13-14 were perfect examples. Bonucci said this earlier this year. I cant find the article but he would know because he is normally the libero. With Conte its either a back 3 or back 5. Allegri’s hybrid formations have simply returned Juve to our glorious history in the late 90’s when we regularly interchanged from 3, 4 or 5 at the back. The key tenant being always retaining a spare man at the back. Allegri’s resembles Lippi in this way.